SensaBubble sounds (and looks) like something Wile E. Coyote would use in his Sisyphean pursuit of the Road Runner, but it's actually a real idea that could become a popular new toy among marketers and event planners. 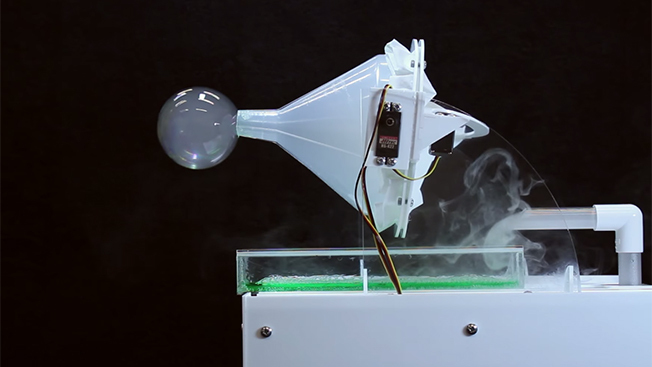 Developed by a team at the University of Bristol’s Department of Computer Science (which explains the intense jargon in the video below), SensaBubble creates bubbles filled with a scented fog, then blows them into the air. When popped, the bubbles release aromatic puffs that linger in the air. Marketers will appreciate that the system also lets you project images and logos onto the bubbles as they fly around the room. If used in moderation, this idea could definitely be a dream for certain brand categories (air fresheners, fragrances, etc.) and a nightmare for people who have to cover their noses while sprinting through the perfume section of a department store.